Derek Wallace has sent us this story of his jaunt around Scotland. At least we think it was Scotland because he doesn’t mention midges once, and refers to something called “hard ground”, which as far as we can tell, has not existed in Scotland since before the last ice age. “Next stop was near Oban. a good site at Connell Bridge, we put up one of the awnings with difficulty because of the hard ground (we did not find out about the steel pegs that the caravan club sell until our last night of the trip at Coniston Water, no other site had them) this night was very wet and windy, the awning nearly, was lost. The next day at Oban was not much better, I had to take some photographs of Oban Distillery for our magazine www.fineexpressions.co.uk which was inside so kept mostly dry. We had two really nice meals in the local restaurants. 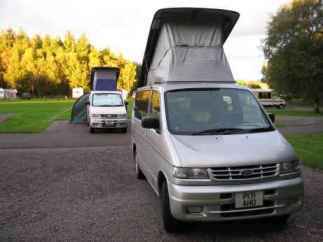 “After two nights at Kinlochewe we headed South to Culloden Moor campsite, calling in past the Black Isle Brewery on the way. Next day we moved on to Park Coppice by Coniston Water (pegs) that evening we had fish & chips from the on-site chip van very good they were too. Next day we headed home. All in all a very good trip, and both Bongos did very well.